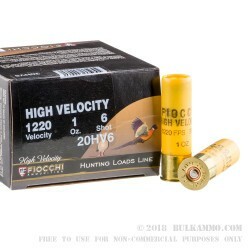 This 20 Gauge shell by Fiocchi Munizioni is loaded with one ounce of #6 lead shot. 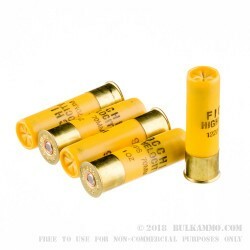 With 225 of these .11” diameter pellets, this shotshell is a well-balanced choice for hunting birds of various sizes, even those that tip the scales toward the turkey range. With an approximately foot wide kill zone at 35 yards, you’ll be able to take squirrel and hare with ease as well as this shot reliably penetrates their little hides. 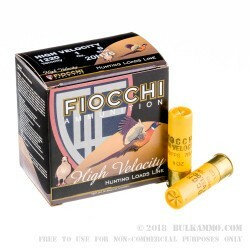 Fiocchi is one of Italy’s oldest and largest ammunition manufacturers, so old in fact that they had to survive the shifting trend from muzzleloaders to breech-loaders. They make all of their components carefully from the ground up, and are one of the favored brands of ammunition for Olympic level shooters. 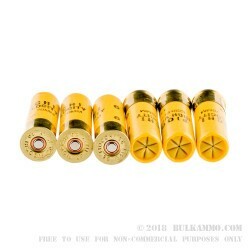 That competition-level commitment to quality shines through in their hunting ammunition as well, which this shell is a fine example of.